One question I see asked over and over again in the cake world is "How do I make my fondant shiny?". There are several ways to achieve shiny fondant, so I've decided to do a fun experiment! Let's do a side-by-side comparison of 4 different popular methods, and see the advantages each method offers, and also see which offers long-lasting shine! Please Note: Because so many different factors can affect the outcome of these different glazes, please test your glaze on a scrap piece of fondant, or on a hidden piece of your cake project before applying to your final project. 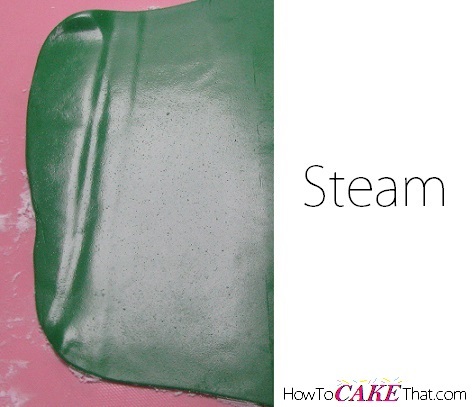 The first method used to make fondant shiny is by lightly steaming it with a hand-held steamer. Steaming fondant helps get rid of any powdered sugar or cornstarch residue and gives your fondant a nice, clean appearance. It also gives your fondant an instant soft gloss. Be careful not to over steam or the heat from the steam can cause the fondant to melt, or too much steam could cause water droplets to collect on the surface of your fondant and cause drips. The second method is using a mixture of 50% light corn syrup and 50% alcohol (150 proof or higher). 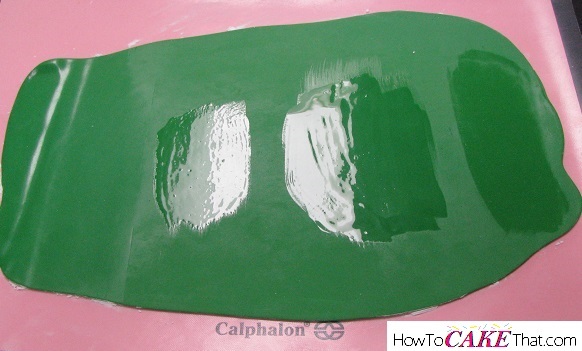 To apply this high gloss glaze, paint on fondant with a good quality soft paintbrush. 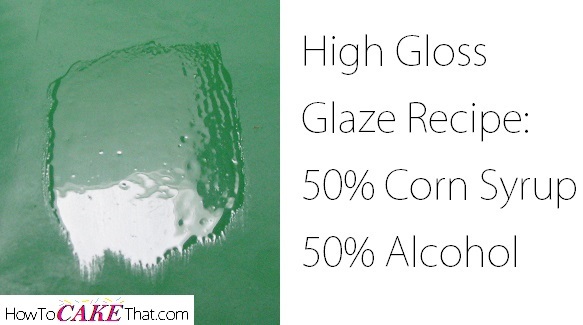 This glaze offers instant glossy shine and would be perfect for making fondant look like glass, water, or ice. Note: fats such as shortening can cause this glaze to separate and give a bubbled appearance. To avoid this, be sure to knead and roll your fondant in cornstarch only. Do not use shortening or any type of oil or fat to knead your fondant. Also, do not rub any type of oil or fat over the fondant's surface that will be painted with this glaze. Be sure to test glaze on a small unseen area of your fondant and allow to dry before painting over the entire surface. And one more thing... if you use any vinyl-like sheets for rolling your fondant, such as "The Mat", you may encounter bubbling in your glaze due to shortening or other fats collecting on the surface of the fondant rolling sheets. If you are concerned that there may be some type of fat on the surface of your fondant, I recommend using the shortening method instead (see below). Note #3: The safest bet for this recipe is to use it on small decorations, but if you are looking for a similar glossy shine to cover a large area check out a product called Dinkydoodle Clear Glaze Shell and Shine Cake Decorating Spray. The stuff is amazing! And it gives you an even, thin glossy coating with just a quick spray! The next glaze is a mixture of 1 part Gum Arabic to 2 parts water (example: 1 tablespoon Gum Arabic mixed with 2 tablespoons water). To make this glaze, place ingredients in a small cup or bowl and stir vigorously. Allow ingredients to sit for 15 minutes and stir vigorously again until all ingredients are well blended. Paint glaze immediately onto fondant with a good quality soft paintbrush. And lastly is shortening. To apply shortening to fondant, dab a small amount onto fingertips and gently rub over fondant until thin and smooth. 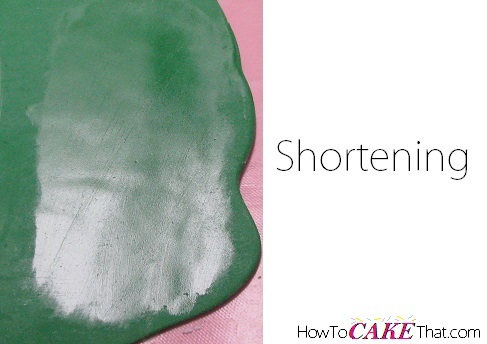 Shortening gives fondant a smooth satin finish. To put these methods to the test, I let them rest at room temperature for 24 hours to see which ones held up and kept their shine! Steam Method: Steaming worked well for permanently ridding the fondant of any powdery residue, but it did not hold a shine at all. As a matter of fact, the shine disappeared about 20 minutes after steaming. High Gloss Corn Syrup Recipe: For permanent high gloss, this recipe is it! This gloss held up beautifully and was just as shiny 24 hours after applying it to the fondant. After sitting for 24 hours, this glaze became slightly hard and can be touched lightly without leaving any marks (grease from fingerprints will show, though), but any pressure into the gloss will leave an indent. Gum Arabic Glaze: This glaze had a very high gloss when first applied, but after 24 hours it has dried to a thin semi gloss finish. Like the Corn Syrup Recipe, this glaze became slightly hard and can withstand a light touch, but any pressure will leave a mark. Shortening: Shortening gave the fondant a beautiful satin finish that held up just as beautifully as it looked the first day! Shortening does not dry and will show any fingerprints, but fingerprints can be easily buffed out with a gentle rub. I hope you have found this tutorial helpful! Thanks for reading, and God bless!